Felix Miranda was just 9 years old when he saw a flyer promoting a guitar class for kids posted at Roosevelt Townhomes, the affordable housing complex where he lives with his parents. He found his father’s guitar, borrowed it, and went to the class—and then the next one, and the one after that, continuing for four years as he fell in love with the instrument. Twelve years later, Miranda plays guitar in a jazz combo, leads a rock band and, for the past 18 months, has been teaching the class he once took—instructing kids at Roosevelt Townhomes in the basics of guitar. He teaches chord diagrams and a little music theory and helps his students learn and perform blues, reggae, rock and traditional Mexican songs on acoustic guitars they get to use for free. On a cold Friday night in November, Miranda and a dozen of his students are lining up on a sidewalk in downtown Salinas for the city’s monthly Art Walk event. They’re standing in front of the offices of CHISPA, the nonprofit agency that builds and manages housing for some 5,000 Monterey County residents. Ruth Rodriguez, CHISPA’s community services manager, is beaming as a group of young drummers from Gabilan Hills Townhomes finishes their performance. Rodriguez knows the organization’s work doesn’t end with housing people in safe, affordable buildings. It’s her job to empower residents, especially children, to expand their horizons through a rich assortment of classes—like yoga for 8-to-12-year-olds, leadership for teens, story time for toddlers, and dance and music lessons for kids of all ages. All the classes are aimed at helping the youth of Salinas improve their literacy and academic skills while exploring music and culture. 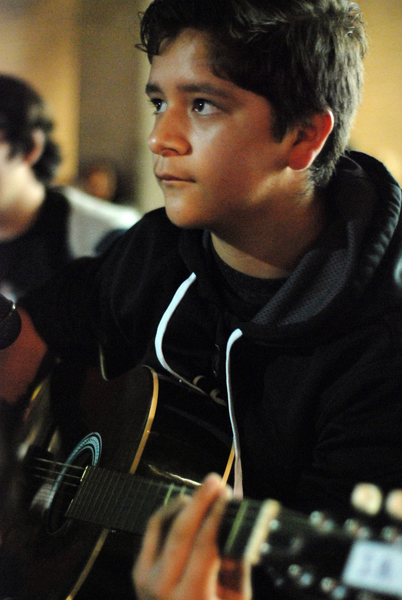 Gustavo Montoro, 13, an advanced student in Felix Miranda’s guitar class, waits for his cue at a public performance in front of the CHISPA building during First Friday, a Salinas tradition on Main Street each month. Miranda calms the young Elvis, hands out guitar picks to his students, and introduces the band. They run through the pop song, “Hey There Delilah,” the patriotic “Viva Mexico,” and get the audience to sing along with “La Camisa Negra.” On a blues song, one of the students, 12-year-old Gustavo Montoro Jr., plays a lead solo, accompanied by Miranda’s strumming rhythm. His parents are happy about the classes too because “they think it will help my future and keep me off the streets and out of trouble,” Junior says. He agrees. Some kids who don’t have good things to do with their time “get into drugs and have bad grades,” he says. Playing music helps motivates him to study hard at school—he’s earning A’s and B’s—and fuels his desire to elevate his musical skills. The number and variety of classes offered by CHISPA have grown in the 12 years Rodriguez has worked at CHISPA. Just as important, she has helped insure that the classes and their instructors fit with the culture and needs of CHISPA families. A few years ago, she noticed that kids from Gabilan Hill Townhomes weren’t participating in programs at the YMCA or the Boys and Girls Clubs, each of which are a mile away. She realized parents didn’t feel safe sending their kids by bicycle, foot or bus alone and arranged to bring more physical activity classes into the community spaces at each housing complex. 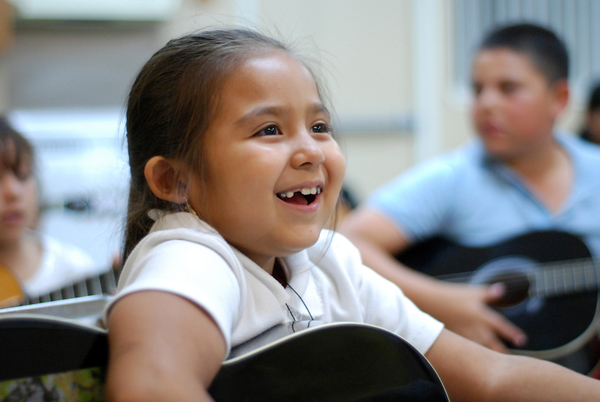 Liz Santoyo, 7, really enjoys Felix Miranda’s open guitar class at CHISPA’s Roosevelt Townhomes in Salinas. She also noticed that some of the instructors CHISPA employed didn’t understand why parents weren’t stopping by, or picking up their kids after class. “They didn’t seem to get that the parents are working long hours in agriculture and don’t get home until late,” she says. So Rodriguez started hiring local artists and musicians like Miranda, paying them decently, and giving them a chance to come back to their community. The strategy has worked. When kids are able to relate to their instructor and feel accepted, it creates a different atmosphere,” she says. “I love the programs run by local talent.” Putting extra money in the pockets of young musicians isn’t a bad thing either, Miranda says, who teaches the class three nights a week while studying at Hartnell College. Two nights before the Art Walk and 30 minutes after his Wednesday night class was supposed to end, Miranda is still in the Roosevelt’s community room, helping Junior and another student practice “Hey There Delilah” one more time. 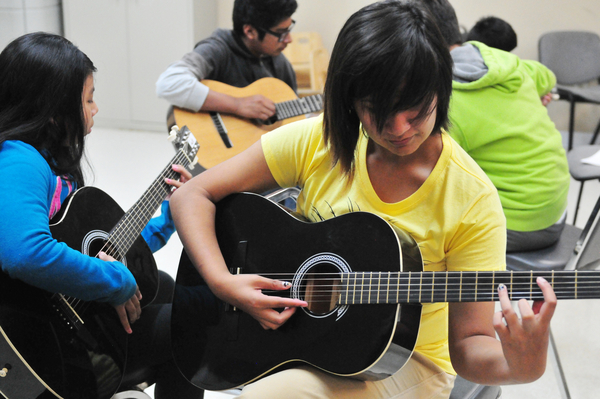 Rosa Rondin, 15, practices at Felix Miranda’s open guitar class at CHISPA’s Roosevelt Townhomes in Salinas. For more information about CHISPA, visit www.chispahousing.org.